Here's a mid-size travel trailer that's just right. Everything's upgraded this year for both practical and upstyle overnight camping or long trips. There's a comfortable lift-up queen bed in front with wardrobe on each side. A full size entrance/exit door for safety and convenience. Windows on three sides give good ventillation and an open feeling. The new vinyl tile-like flooring looks rich and is easy to clean. The tub shower surround is also tile patterened for an enriched feel. The rear bath is full width with one wall asl wall wardrobe. A decorative valence encloses the shower curtain. Step inside the rear door into the walk through galley with double sink and two-door two-way refer. A range with oven, microwave, and pantry complete the area. Centerward is the sofa bed on it's electric slider accross from the dinette bring sleeping capacity to six. This 2009 model introduces the combinaton flat screen/DVD wall-mount TV which is easily moved to it's own mounting on the outside of the coach under the 14' awning. Of course there's ducted furnace and A/C. And there's full-width storage up front. Diamond plate on the front acts as a stone guard as does the opening window covering. 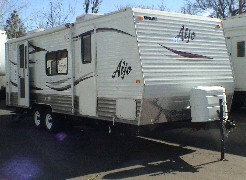 This unit is fully self contained & ready for RV'n at it's best. 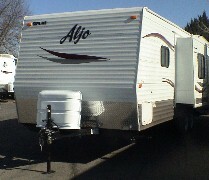 This units includes (2) 30# LPG tanks and mounted spare tire with cover..
Tow and Go right now at Brown's RV.